The Blueberry Cluster of stone piles is a small cluster, comprised of half a dozen piles scattered loosely through the woodland surrounding the cleared area close to the Trail. However, it is representative of the more usual density of such stone piles in this area along the southerly flank of the Nashoba Brook, where they occur with some regularity. Seldom are they as densely placed as those that may be seen at the Plantain Cluster, a short distance west of the site. Figure 1 shows a view of this cluster of stone piles. Indians often created mounds, or piles, such as these, to memorialize an important event, death, or person. At other times, stone piles, earthen mounds, or piles composed of other objects, were part of ceremonial and/or astronomical complexes, where they marked sight-lines to significant annual astronomical events. They have also been interpreted as a way of signaling an Indian’s intention to reinforce his bond with Mother Earth. As the hiker progresses westward along the Trail toward the Plantain Cluster, additional piles may be seen, obscured within a brushy area, or nestled in a small level patch off the Trail. Also plentiful throughout this area of the conservation lands are what are sometimes referred to as ‘portals’ (to the womblike aspect of Mother Earth). These are comprised of naturally occurring paired rocks now firmly embedded in the soil. Originally, a single boulder with a fault line was deposited by the receding glacier. Over the eons, the boulder was forced apart at the fault line, by the freezing and thawing action of water. 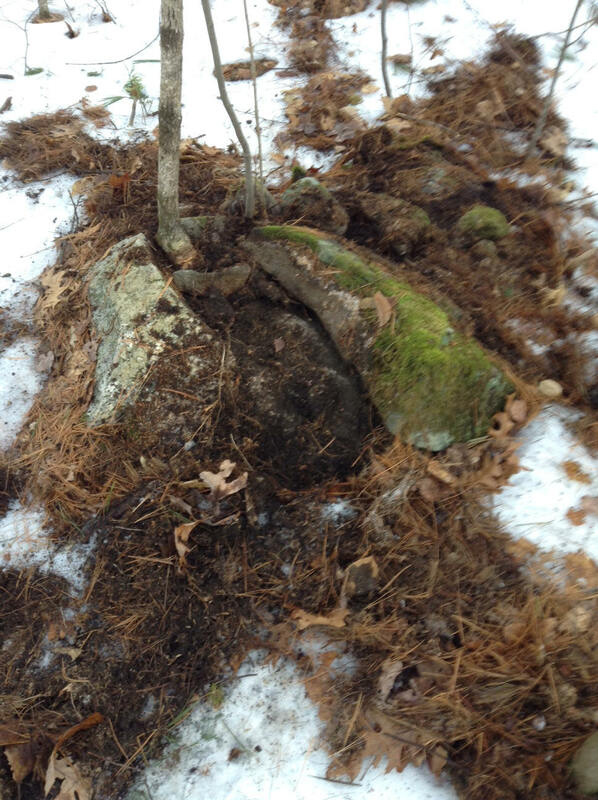 This type of split boulder is easily recognizable by the two matching faces of the resulting cleft. Evidence that such a pair was selected by Native Americans to represent a portal, lies in the presence of one or more small rocks that have been placed into the cleft. These rocks are often of different material and color from the host boulder/pair. The smaller rocks may be angular or rounded. See Figure 2. Skeptics might argue that these enhanced pairs are the recent work of Boy Scouts or other naturally curious people. However, consider the fact that these enhanced pairs do not occur in large numbers anywhere in these conservation lands, as the stone piles occasionally do, but are scattered throughout the woodlands, and elsewhere, far from modern trails. The presence of both the portals and the stone piles reinforce the belief that Native Americans saw the natural world as imbued with a spiritual quality. These structures also exemplify the principle practiced by Indians, here in the Northeast and elsewhere, of subtly enhancing naturally-occurring features of the landscape rather than of building large, prominent structures that intrude upon that natural landscape. Funding for the informational panel on which this material will soon appear in the field was supplied by a vote of Town Meeting authorizing the use of Community Preservation Act funds. Text was developed by Linda McElroy, the Trail Through Time’s project director, with Peggy Liversidge, associate land steward.